But there is a lot more to Newt Gingrich than these remarkable achievements. As an author, Newt has published twenty-eight books including 14 fiction and nonfiction New York Times best-sellers. Newt and his wife, Callista, host and produce historical and public policy documentaries. Recent films include The First American, Divine Mercy: The Canonization of John Paul II, A City Upon A Hill, America at Risk, Nine Days That Changed The World, Ronald Reagan: Rendezvous with Destiny, Rediscovering God in America,Rediscovering God in America II: Our Heritage, and We Have the Power. Gingrich, a strong advocate of volunteerism, has long championed the positive impact every individual can have on society. He has raised millions of dollars for charity, donating both time and money to a wide array of causes, including Habitat for Humanity, United Cerebral Palsy, the American Cancer Society, and ZooAtlanta. As a former environmental studies professor, he is widely recognized for his commitment to the environment and to the advancement of a new, common-sense environmentalism. In 1998, the Georgia Wildlife Federation named him Legislative Conservationist of the Year. His experiences as the son of a career soldier convinced him at an early age to dedicate his life to his country and to the protection of freedom. Realizing the importance of understanding the past in order to protect the future, he immersed himself in the study of history, receiving his Bachelor’s degree from Emory University and Master’s and Doctorate in Modern European History from Tulane University. Before his election to Congress, he taught History and Environmental Studies at West Georgia College for eight years. 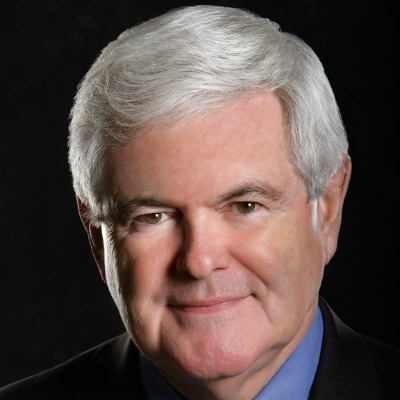 Newt resides in McLean, Virginia with his wife, Callista Gingrich.